Dr. Moore grew up in Nashville, Tennessee. He graduated from Vanderbilt University with a Biology degree and received his DOS degree from the University of Tennessee College of Dentistry. Upon graduation from Dental School. Dr. Moore was honored with the Pediatric Dentistry Achievement Award as the outstanding dental student in the field of pediatric dentistry. Dr. Moore then completed a two-year residency In Pediatric Dentistry at the University of Tennessee where he received a Master of Science degree. Dr. Moore’s master thesis involved a study of the effect of chemotherapy and/or radiation on the teeth of children undergoing cancer treatment at St. Jude’s Children’s Hospital. He has practiced full time in the Memphis area for over 20 years. In June 2010, he relocated his practice to a new office in Germantown Tennessee. Dr. Moore is a member of the American Dental Association, the Tennessee Dental Association, the Memphis Dental Society, the Southeastern Academy of Pediatric Dentistry and the International Society of Orthodontics. Dr. Moore maintains hospital privileges at LeBonheur East Surgery Center in Memphis. 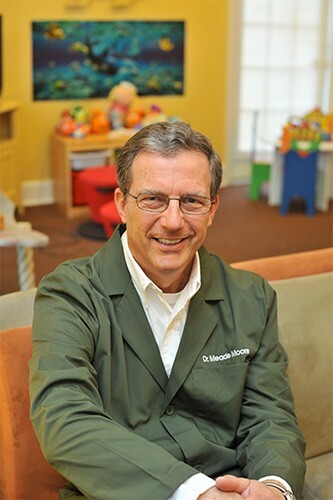 Dr. Moore has been consistently listed as one of the top Pediatric Dentists in the Memphis area by various publications, including Memphis magazine and Memphis Parent. Dr. Moore has been active in civic and church activities including dental mission trips. He has served on the Board of Trustees of Briarcrest Christian School. He is an active member of Hope Presbyterian Church in Cordova Tennessee. Dr. Moore enjoys many interests and hobbies including fishing, hunting, gardening, music and boating. Dr. Moore and his wife have two sons.